Countries throughout the world have a need, and in many cases a legal obligation, to ensure air quality is meeting specific standards. Policies aim to reduce exposure to air pollution, by reducing emissions and setting limits and targets for AQI. Public authorities in cities have deployed static stations to monitor air quality data for a set of pollutant with specific, and high cost, sensing technologies. These stations provide highly accurate data but their cost limits the quantity of deployments, leaving large gaps in coverage. 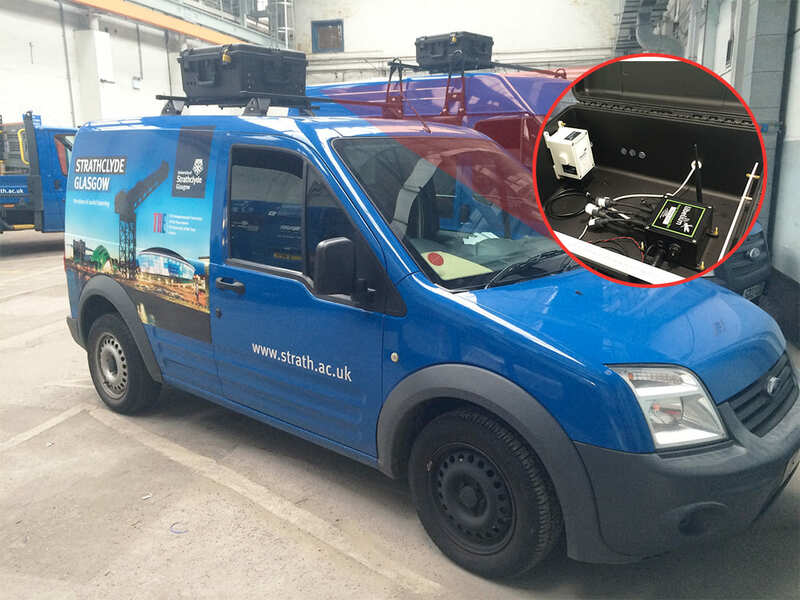 CENSIS, the innovation center of excellence for Sensor and Imaging Systems (SIS) technologies, has developed a low-cost system with Libelium Waspmote Sensor Platform in Glasgow (UK) that can be deployed flexibly and rapidly in mobile configurations to complement static stations providing more capillarity to Smart Cities projects. CENSIS has worked in partnership with the University of Strathclyde on this project that has been called “Sensing the City”. The aim was monitoring in real time key air parameters in different areas from a city in a dynamic way. For this last reason, they thought in a mobile wireless sensor network system placed on top of the vans to move through all the city. “Our initial requirement was for sensor nodes with a variety of configuration options. From an evolution point of view, we now have the potential to add new sensor nodes or to change sensor nodes”, argues Stuart Simpson, CENSIS Senior Engineer. The sensor node consist on a box with the Waspmote Plug & Sense! Smart Environment PRO inside and also the different sensors: CO, Particle Matter – dust sensor, (PM1, PM2.5 and PM10), temperature, humidity, pressure, NO, NO2 and O3. These are some of the most important parameters to control air quality and detect gas emissions or pollutants. All the information monitored by the Waspmote Plug & Sense! Sensor Platform is sent to the sensor hub, which is located in the vehicle glove box, through 802.15.4. Its is composed by Raspberry Pi2, a GPS Antenna (to allow the tracking) and Zigbee. 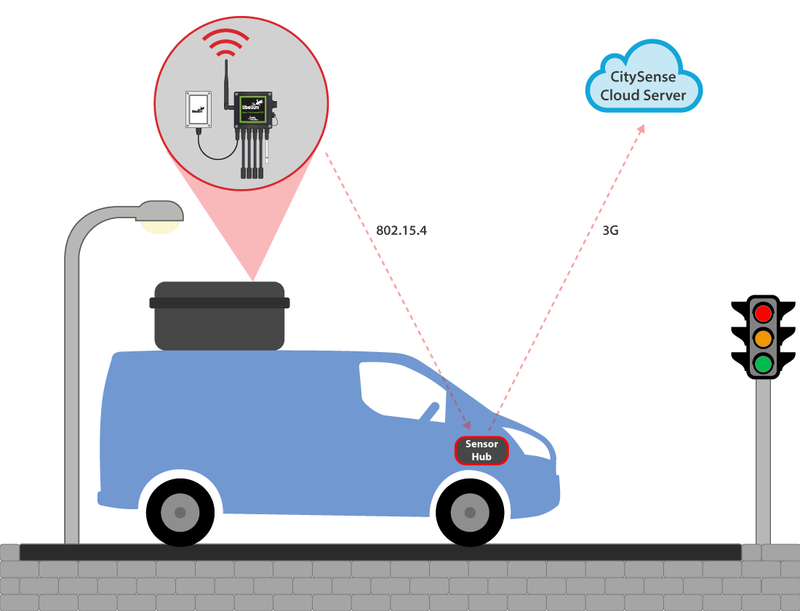 The information gathered is sent to the cloud via 3G and visualized in CitySense, based on Microsoft Azure IoT platform. CitySense is a web-based user interface that allows data visualization, interaction with the cloud services and includes capability to embed data processing and analytic outputs. The Decision Support System allows to create spatial and temporal high resolution air quality maps. “Sensing the City” project can provide indicative air quality data in areas without coverage in order to support identification of pollution sources. Mobile systems can also gather data in a volume and with the rapidity required to support comparison of pollution models and to identify trends. Reliable capture of sensor readings from multiple nodes against location in near real-time. Low-cost and flexible/scalable system: allows update to sensors, processing platform and cloud service. Robust system operation: able to record and upload sensor readings during 3G signal loss. Efficient cloud-based data gathering platform. Temporal and Geo-Spatial visualization of Air Quality data. Remote access allowing Over-the-air (OTA) updates configuration and debug. 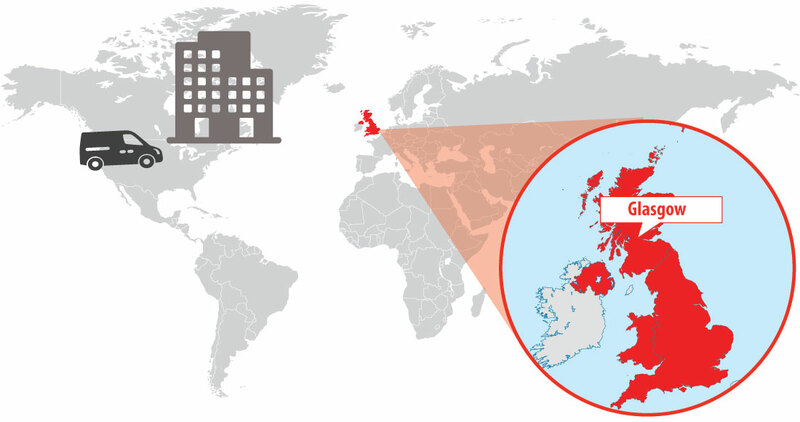 CENSIS Senior Engineer, Stuart Simpson, considers that Libelium technology “offers a large range of sensor nodes, which offer us the flexibility we need for the future“. The project is currently in phase 1 with future plans to grow coverage, develop analytic, extend communication protocols and optimize sensor accuracy and sensitivity – and to test in a wider range of cities. The next stage will also include other applications areas for Smart Cities apart from air quality such as road conditions monitoring, traffic management or energy conservation of buildings via thermal imaging. The final aim is developing a system able to give a whole solution for public authorities.